ADCO Class B RV Covers are perfect for the RV owner who needs to cover their unit but doesn’t want to pay an arm and a leg for a custom cover. Since ADCO is North America’s oldest protective cover company, you can rest assured that you are purchasing a quality product that’s guaranteed to fit. ADCO Class B RV covers start at $174.82 and each cover comes with a 2 year warranty. When you use an RV cover, you greatly reduce the amount of work you have to put into washing and polishing your unit. A cover will preserve the value of your Class B, and help keep it looking new. 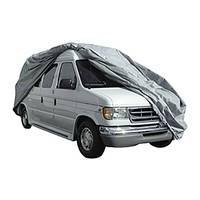 Select a Class B van cover from ADCO to start protecting your investment today.